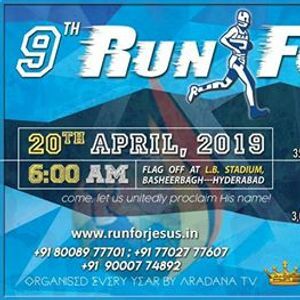 9th EDITION of RUN FOR JESUS. RFJ's main objective is to proclaim the message of Crucifixion and Resurrection to all our neighbouring communities in a very sportive way. 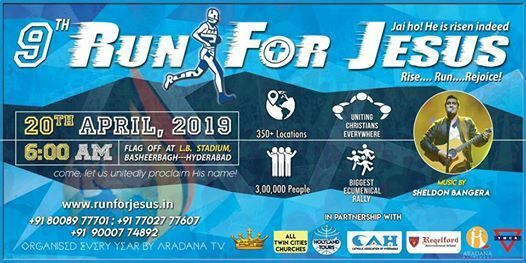 RFJ has become the most cherished annual Christian event conducted across the states of Telangana, Andhra Pradesh, Karnataka and in parts of Tamil Nadu. Aradana TV has been organising this mega event successfully since the last 8 years on the eve of Easter, which is to signify both Good Friday and Easter. This mega event will be held on Saturday, 20th April, 2019 simultaneously in over 350+ locations across India, with a vision to unite the community and to spread the message of the two Holy festivals to our neighbouring communities. COME! Join the RUN FOR JESUS Movement! Or call: +91 8008977701, +91 7702777607, +91 7702777787.